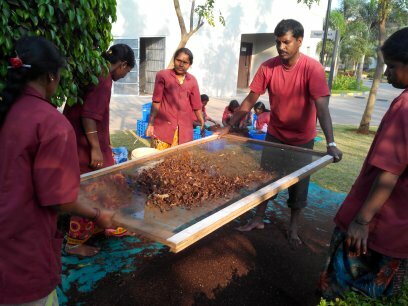 Housekeepers sieving the compost prepared from kitchen waste. There’s reams of data on the internet on various composting methods written quite beautifully by green enthusiasts worldwide. However, after wading my way through this maze of information and sending distress calls and emails to compost experts I have been in touch with, this is where it stood: It’s all theory until you do it yourself. The reason: Case studies offering crucial information on how to go about it at a community level, particularly in India, which can help you evolve contextually are few and far between. Driven by a simple desire to produce rich organic manure (and absolutely zero practical experience) meant one thing: in-depth research and legwork. When we kicked off solid waste management on October 2, 2012, at Sobha Althea-Azalea, Yelahanka, the dream was to see the model sustain with high compliance rate and of course, produce rich organic compost—all inhouse. While the first was realised in just over a month, thanks to our sincere segregators, fellow-volunteers and the staff, composting on a large-scale was a different matter altogether. There are many conflicting theories on what suits a 202-strong residential community and quite the contrary, there are hardly any successful examples to help you zero in on one that suits the community the best. Composting at individual level is quite different from the one done on a large-scale. An individual has full control over what goes into the compost bed and it’s just not the same when you ask an entire community to be part of the process. The chances of going wrong are very high and sometimes, totally out of your control. Similarly, composting done at institutional level is also different as experts are involved full-time with experienced helps around. It’s a professional setting, far different from what a resident green volunteer has at his or her disposal. But still, although inexperienced, it’s the never-say-die attitude of the volunteers that sees them through, almost always. Firstly, the method should produce rich organic compost and no half measures when it comes to its quality. You do not want stinking mess on your hands after investing money, time and effort. Secondly, the existing space in your apartment complex set aside for this activity and budgetary allocations should support the model you choose. Please note that not all the resident associations think green. Thirdly, apart from being cost-effective, it should be less labour- and water-intensive, not completely power-driven (as it defeats the very purpose of reducing carbon footprint) and low on operational costs. Lastly, once implemented, the model should be a sustainable one calling for minimal everyday intrusion and give you the luxury of making it process-driven and not person-centric. After research on all possible composting methods available in Bangalore and meetings with NGOs and activists, the upshot was rather too disappointing: Each one of them fell short in fulfilling more than one of the above conditions. Some did fail in all! Luckily, during one of my visits to Gandhi Krishi Vignana Kendra (GKVK), I got to see vermi-composting done by scientists on the campus. Following a string of meetings with the experts here, I made a trip to Krishi Vignana Kendra (KVK) near Doddaballapur. Here, a GKVK scientist introduced me to a consultant who was taking care of their compost beds. This entry was posted in Community Composting, Endlessly Green and tagged composting, Going organic, large-scale composting, organic compost, Waste segregation at source. Bookmark the permalink. ← GOING ORGANIC-4: Just compost it, dammit! hello, savita. again a nice article. I can co-relate to this feelings. After started doing composting at a personal home level, I have initiated the same in my community. So far all is going well, that is to reach and take approval of my society members. We are going to use daily dump Manthan composter for our society’s wet waste management program. I just hope everything turns out good and we get our first product in next three months or so. Secondly i would like to ask you if you have any idea about this product? I don’t see any reviews or case studies here on your blog. Since we haven’t started on this yet it would be wise to gather expert opinion or past experiences about it. Nice to know about your efforts to take composting forward in your community. Each community always needs just one or two champions. The rest falls in place on its own. I am yet to do a case study on Manthan as well as Aaga–both from Daily Dump. Planning to finish the work at the earliest. thanks for the reply. i will wait eagerly to know about your point of view for daily dump composters. Here in Mumbai I just have that service available through a clone company. Thanks again. Very true. I am finding the same challenges. I started with myself and when I am trying to check the feasibility of implementing this at my society level, facing the challenges listed by you. Our society is huge one 1000 units and this is going to be a huge challenge on all fronts listed by you. We are doing kind of evaluating all options. Will wait for your next post and we will also keep evaluating. Thanks, Sidharth. Please do go through all the community composting methods I have documented. It’s in ‘Community Composting’ category. We can discuss what suits your community once you are done reading. Thanks. Already done. Sure. Will touch base.